As UAB’s overall enrollment reached a record high for the third consecutive year, we and our community are celebrating more than the remarkable growth of our student body. We are also celebrating another year of widening access to higher education for talented and diverse students throughout our state. We are especially proud that nearly 29 percent of our first-time freshmen are first-generation students, and the number of such students has increased by 32 percent since 2010. Building the pipeline to higher education is particularly vital in our state, which, according to the 2018 Alabama Poverty Data Sheet, is making incremental gains but remains the sixth poorest in the U.S. with more than 800,000 of our citizens living below the poverty line. The data further underscore a glaring correlation: tracking precisely with Alabama’s poverty ranking, we are also the sixth-lowest nationally in educational attainment (percentage of population aged 25 and older with a bachelor’s degree of higher) at 24 percent, trailing the U.S. overall at 30.3 percent. Equally telling is how indirectly proportional educational level is to the rate of poverty: 30.9 percent of Alabamians 25 and older without a high school diploma live in poverty but the rate drops dramatically among those with a diploma or GED (16.3 percent), those with some college experience or an associate’s degree (12.2 percent) and those with bachelor’s degree or higher (4.4 percent). These data demonstrate that removing barriers to prosperity is largely a matter of opening avenues to education. Doing so requires strong partnership and alignment among higher education and K-12, our local communities and state, and business and industry. UAB is pleased to partner in a host of such programs that are at the heart of our mission. One of those is Blazing Start, a partnership with Birmingham City Schools and other school systems that admits freshman who do not meet UAB’s automatic acceptance criteria (such as minimum ACT score), but who have otherwise performed well academically and are motivated to succeed. This program provides them with extra academic support. Since inception in 2013, the program has brought 431 students from 184 different high schools to our campus. Similarly, our Joint Admissions Program gives participating students from our six partner community colleges access to our campus and resources and ultimately admits them to UAB upon completion of their associate’s degree. A total of 275 students have benefited from this program over the past four years. In the face of economic disadvantage, education is the great equalizer. Our students go on to rewarding careers and, at the same time, help our state compete in a global knowledge economy. We need only continue opening those avenues to education and students will pursue that “clear vision and path,” achieve, and prosper—and the state of Alabama with them. 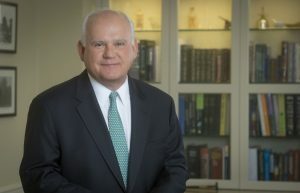 Dr. Ray Watts is the president of the University of Alabama at Birmingham.